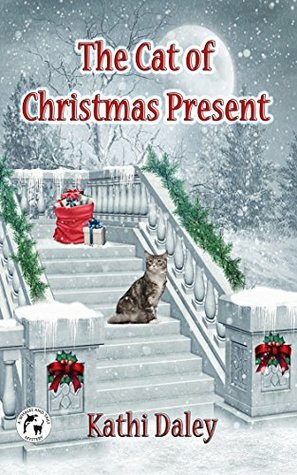 The Cat Of Christmas Present is the tenth book in this series and it has everything I look for when reading a cozy. There are great characters to get to know better, a setting that pulls you right into the story, animals to enjoy reading about and a mystery to solve. The characters are well developed, well rounded and three dimensional. I enjoy reading about all of the relationships between Cait and her friends and family. They all care about each other and are willing to help out whenever anyone is in need of it. Cait and Cody are great people and they make a really good couple. A new character was introduced in this book and I am curious to see if he makes an appearance in any future books (I hope he does). The mystical cat in this book is named Clarence and I thought that was a very clever name. I am always entertained finding out how these cats will help solve the mystery. The mysteries are well plotted and carried on well throughout the entire book. As is typical from this author, there is more than one mystery to solve. They include who is the stranger that is found at the beach, what happened to the bank robber that has been spotted on the Island, and what will happen to Coffee Cat Books? It is always fun to have more than one mystery to ponder and try to solve. I enjoyed the fact that Cait did not stumble upon a dead body in this book, I found this refreshing. I would recommend this book (and all of the books in this series as well as the other series written by this author) to anyone who enjoys a well crafted cozy mystery. If you are looking for a great Christmas mystery (or just a great mystery in general), then this is the book for you.